Free Shipping! Customer Satisfaction Guaranteed. Fast shipping! Great parts great seller! Doesn't work, you need a t-mobile account. I don't have one..
T-Mobile says ONLY T-Mobile sold devices will work, no third partys! See FAQ's. I had a carrier that uses the tmobile network and they said this would increase my signal at home. Make sure you are a tmobile customer first because your number and address has to be registered with them before it will work. You must have wired internet for this to work. I bought this to improve weak cell signal. So far I cannot use it all because it will not work unless connected to high speed cable internet service. 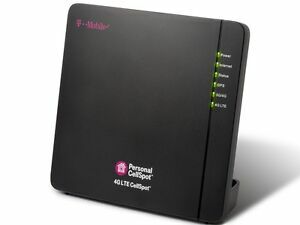 After switching phones to T-Mobile, I inquired about having the CellSpot activated and was told that it should have been activated when it was purchased. T-Mobile informed me that I could send it in to them and then get a HotSpot for $25. Followed all the instructions for use, but it never worked. After receiving this item, Tmobile stated it could not be activated or was not compatible using the provided IMEI. Give them the serial number, no go. All lights come on green except 3G & 4G/LTE, they do not light up at all.